Mix all the ingredients with little water. dont add too much water & the batter consistancy should be thick. take the sev maker , put the soft dough in it. It is a great snack with tea time & diwali snack. sri.........yummy and crunchy snack dear. 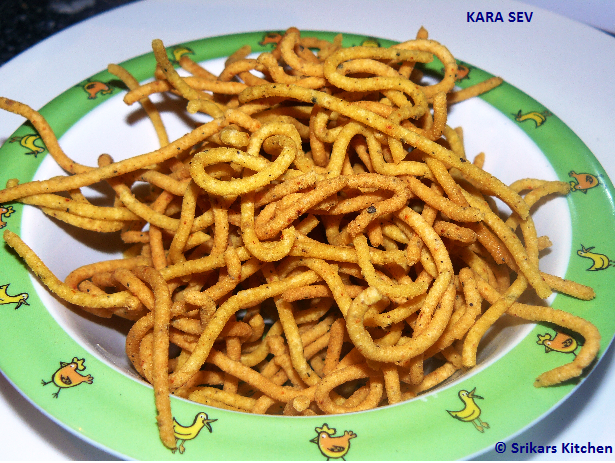 Crunchy kara sev looks prefect! kara sev looks perfectpriya.looks yumm! Crunchy yummy snack, looks delicious. my husband loves this.i'm gonna try this for sure. looks yum! Good to see this recipe, its been a while to see traditional snacks around. I wanted to try this for diwali but dint :( Have bookmarked urs.. Iam going to post Kadai okra tried from ur blog ..Plz have a look :) Thanks !! all time favorite kara sev looks tempting. First time to ur space and loved the interesting and simple recipes. Karasev looks fresh and crunchy. Following u. Visit mine when u find time.